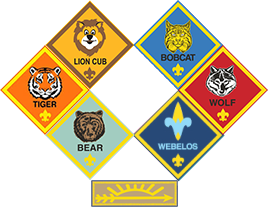 If you are in a Bear or Webelos den now, you will be a Webelos this summer and eligible to go to Goshen. Goshen Scout Reservation has 6 resident camps. We will be attending Camp PMI, which is for Webelos. We will need 1 Adult to attend the camp for every 5 Scouts who register. Make plans to attend if at all possible. There are 6 week-long sessions for Resident camp. Sessions start in June and end in August. If you can't make the session we selected you can register for a different session individually. Camper Aid is available. An application form is available here. You will want to participate in this camp. It is a blast and the staff at camp is top notch. Camp will be run by our very own Catoctin Mountain District Executive, Mychal Tamilow. There is no hard deadline to join, but the price goes up the longer you wait. Visit the Camp PMI page for additional details about this camp. Email Pack 1070's Goshen Point of Contact with any questions.